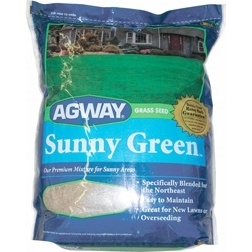 Sunny Green is an exclusive AGWAY mixture of premium, disease-resistant perennial turf grasses for full sun lawns. Thrives in hot and sunny conditions such as open yards with few trees. Contains Scotts exclusive Thermal Blue Kentucky Bluegrass. Aggressively spreads to repair thin and bare spots. Survives the scorching heat.